This tower is in Jericho, not Syria. Tell Qaramel, on the Qoueiq River, is 25 kilometers (15 miles) north of Aleppo in northern Syria. In 1999, a joint Polish-Syrian investigation of this area was led by Professor Ryszard F. Mazurowski of Warsaw University. They came up with a number of astonishing discoveries – among them five round stone towers, each more than 18 feet in diameter with walls over four and a half feet thick. The site has been carbon dated to between 10,900 and 8850 BC. The towers were built around 10,000 BC, older than what was previously believed to be the oldest known stone tower in the world, the one found at Jericho. Depending on the dates used for the tower at Jericho, the towers in Syria are between a few hundred years and two thousand years earlier. These dates fall between the Younger Dryas, a time of cold and drought, and the early Holocene, when the earth began to grow warmer, following the Ice Age. We are still in the Holocene epoch today. The dates of Tell Qaramel are, for Phase One: 10,900-9,700 BC; for Phase Two: 10,300-9,300 BC; for Phase Three: 9,280-8,850 BC. Phase One and Two overlap. This is one of a number of discoveries in recent years which take the origins of civilization much farther back in time than previously believed. These origins now extend back to the last Ice Age, long before archeologists used to think civilization began. Sadly, Aleppo is now a battleground in the Syrian Civil War, and, as is the case in all wars, ancient archeological sites are in extreme jeopardy. Aleppo itself is one of the oldest cities in the world, and has been inhabited since at least the sixth millennium BC, as is shown by the dating of excavations there in Tallet Alsauda. Aleppo is mentioned on cuneiform tablets in Ebla and Mesopotamia during the third millennium BC, when it was known as Armani to the Akkadians. It is a much older city than Damascus. The five round towers from around 10,000 BC, 15 miles north of Aleppo are older than the Pyramids, older than Stonehenge, older than every other stone building in the world – at least among those we know about. There is every reason to believe that there may be many extremely ancient civilizations buried under the sands and on the sea floors of the world’s oceans. Of the builders of the round towers, we do not know the name of the people who built them, their language, where they may have come from, and who they may have become during their travels through history. There is so much about our past on the earth that we have no inkling of. A technical discussion of Tell Qaramel dates can be found here. Photo: Reinhard Dietrich / Wikimedia Commons / “I, the copyright holder of this work, release this work into the public domain. 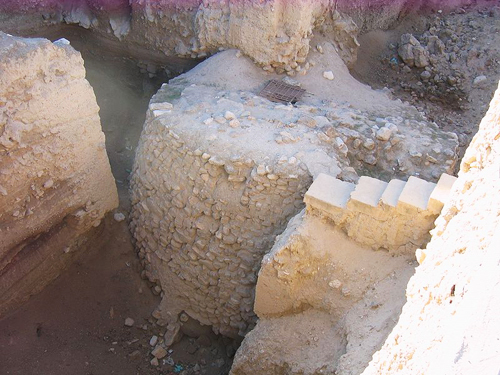 This applies worldwide.” / Tower of Jericho, Tell es-Sultan archaeological site, ca. 7000 BC.